Another day, another co-worker treating us to donuts. Given my love for donuts, this is never a bad thing. This selection came from AllStar Donuts, a no frills donut shop (and uh, cafe with burgers and Asian inspired rice plates ...). I haven't visited myself, but given the location at 9th & Mission, I imagine it isn't the sort of place you really want to spend much time. That said, they had good donuts. Our co-worker brought a selection of raised, glazed donuts: chocolate glaze, maple glaze, and honey glaze. Since the others were all chocoholics, I let them go for those, but I'll admit, the chocolate glaze looked pretty great. I only got to try one donut, so, I can't comment on much else, but my donut was quite good, and if anyone showed up with All Star Donuts again, I'd gladly accept them. Maple Glazed Raised Donut. $1. I opted for the maple glaze, mostly based on the wonderful maple aroma. Mmm, maple! This was a shockingly good basic raised donut. It was huge, no skimpy donuts here. Fluffy, light as air. It didn’t taste greasy or heavy. Fantastic raised donut. The maple glaze was generous but not overwhelming. Sweet, with a nice maple flavor. 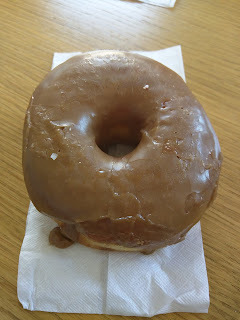 I usually go for more decadent creations like fritters or jelly donuts, but, this was an excellent raised donut. 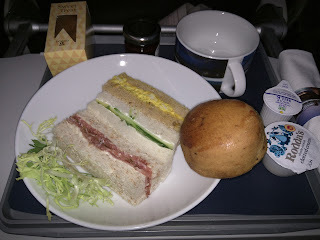 Another day, another afternoon tea flight on British Airways. Since I've reviewed it several times before, I'll skip all the general details this time around. The offering was exactly like every other time: 3 little sandwiches, a scone and clotted cream, boxed cake. And, just like every single time I've ever had tea service, I've instantly regretted not requesting a special meal, as many others around me had done. They all had salads. The rest of us? Stale tea sandwiches. Ugh. The first one looked like curried egg salad. Now, I like egg salad actually, but I was suspicious of the curry. I asked Ojan, "Is it curried egg salad?" and he said yes. So I took a big bite. It wasn't egg. It was CHICKEN. I really hate chicken, and this was very "chicken-y" chicken. I didn't really taste the curry at least? The bread was a soft, hearty grain bread with some seeds in it, not bad. Perhaps this was actually a decent sandwich ... if you eat chicken. I moved on to the safer option, the middle one, which was clearly cucumber and cream cheese, on white bread. A simple classic. The cucumber was wilted, if that makes sense. It turns out, thin sliced cucumber can actually wilt, when prepared days in advance. This was pretty lackluster. Finally, salami and pickles, on wheat. The salami actually wasn't bad, and I did like the pickles. If only it had some cheese too, or, really, if it were just a charcuterie plate rather than a sandwich. Overall, it was possible to salvage some proteins from the sandwiches, but I was glad I had snacked so heavily in the lounge and wasn't counting on this "meal". Scone service was as it always is, a basket passed without tongs, into which each person dipped their hands. There were plain and fruit scones, I opted for the fruit one, which seemed to be raisin. It also tasted like orange. The scone was ... ok. It was warm, and the top was actually nicely toasted, but the bottom was hard and soggy at the same time. The jam was ok, not particularly good nor bad. The clotted cream was standard too. Overall, just, standard. Yes, if you slathered plenty of jam and cream on the scone it was ok, but, no component was very good on its own. And finally, the "Sweet Treat". It was the same pistachio madiera cake I've been served many times at hated, so I didn't bother try it.